Irancy lies two kilometers from the Yonne River and is surrounded by a large natural amphitheater of vines. Lying 18 kilometers southwest of Chablis, it one of the most northern areas in France that grows red grapes. Viticulture has been practiced in the region for at least twelve centuries, and the arrival of the monks in the 11th century saw even more focus on wine. Up until the revolution at the end of the 1700s, the inhabitants of Irancy was largely dependent upon the Abbey Saint-Germain in Auxerre. Irancy was also the birthplace in 1713 of Jacques-Germain Soufflot, the neo-classical architect whose most famous work is the Pantheon in Paris. When the phylloxera hit the region in the late 19th century, most of the vineyards were wiped out and it took the area nearly fifty years to recover. Strangely, vines planted on American rootstock produced few grapes. Moist weather led to problems with mildew and insects. During the First World War, the small village lost more than 30 of its men. Between the two World Wars, vineyards dwindled to less than 20 hectares. It was only after the liberation of France that the vineyards began to once again expand. Today the Irancy appellation covers some 315 hectares, but only about half of that are planted. During the 1970s, Irancy was a VDQS (Vin de Qualité Superieur) and its producers were eventually allowed to label their bottles Bourgogne Irancy. In 1991, the VDQS was extended to cover some of vines in the neighboring communes of Cravant and Vincelottes. 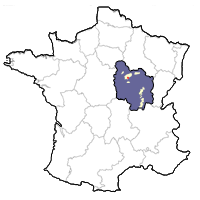 Finally, in 1998, Irancy was awarded its own appellation, joining two other villages in northern Burgundy: Saint-Bris and Chablis. While a small amount of rosé is produced, the region produces mainly red wines made with Pinot Noir (which must account for 90% of the blend). Also permitted are lesser-known Burgundy varieties César, a highly productive, late ripening variety that adds both color and tannin, and the nearly extinct Tressot, apparently a cross between Duras and Petit Verdot. The vineyards of Irancy are planted on slopes composed of Kimmeridgian limestone, often interspersed with cherry orchards. This highly-mineraled soil and a cool climate help to give the wines of Irancy bright acid and a mineraled tang, highly enjoyable in warmer weather when served with a light chill.